The Nvidia GeForce GTX 950 is launching on August 20, according to Japanese tech site Hermitage Akihabara. 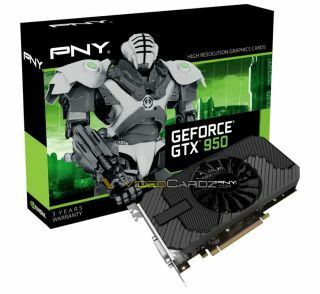 There are also a number of leaked images of the graphics card from various manufacturers such as PNY, Zotac, and Gigabyte, as well as some technical specifications thanks to Videocardz. The card features 768 Compute Unified Device Architecture (CUDA) cores and 2GB GDDR5 memory across its 128-bit interface. Its memory clock is 6.6 GHz, meaning it is 100 MHz slower than the GTX 960, which launched in January this year. In addition, the GTX 950’s thermal design power is 90W, according to Videocardz’ leak, which means it requires a 6-pin power connector, visible in some of the leaked card images. In terms of outputs, it has 1x DVI, 1x HDMI, and 3x DP—the same as the GTX 960. Keep in mind that ports can vary between card models as well. The PNY card pictured above (leaked on VideoCardz) features a single fan cooling system. Gigabyte has two factory overclocked cards incoming, one of them using the WindForce 2X cooling system, with the other using a single 90mm fan. Zotac has three GTX 950s coming, one with a single fan system, another with a dual fan which is overclocked to 1102/1279 MHz. The third is overclocked to 1203/1403 MHz, as well as having its memory clocked at 7 GHz. Asus will also be releasing a card, but we don’t have an image of its GTX 950 yet. A couple of early listings appeared on some European retailers last week, with prices reaching as high as €280. Since a new GTX 960 costs less than that, expect the prices to be more reasonable when it is available. None of the leaks indicate how much the GTX 950 will cost in the US.